Adjustable door guide with two rollers for bottom of the barn door prevent your door sway away from the wall. Works with all brands of sliding barn door hardware. Steel adjustable roller, smooth and quiet roll works with doors up to 2 1/5 " thick. Easily mounts to wall with 2 mounting screws (included). Looks great both indoor and outdoors. The distance between the floor and the door should be at least 1/4". No need to cut a groove in the floor. The individual hardware is available from our U.S warehouse. If there is any part missed or broken, we can ship the parts to you at first time. Before you open a case, please contact us freely, we will solve your problem within 24 hours. The wall mount door guide can works with all brands of sliding barn door hardware, compatible with barn doors thickness up to 2 1/5". 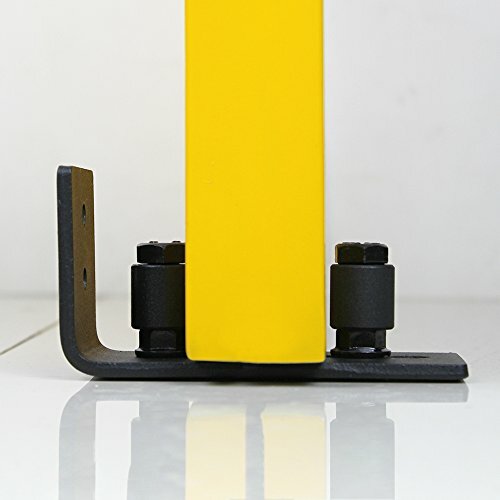 Two small adjustable rollers make the door slide smoothly and safe. Easy to install, tighten the screws to the position and you are ready to slide the door. Powder Coated Black Finish for longer lasting and can be used for both indoor or outdoor. The package include 1PC door guide with two screws. Make sure the clearance from your door bottom to floor is greater than 1/4". Then Attach 2 screws into baseboard and tighten guide in place. If you have any questions about this product by WINSOON, contact us by completing and submitting the form below. If you are looking for a specif part number, please include it with your message.